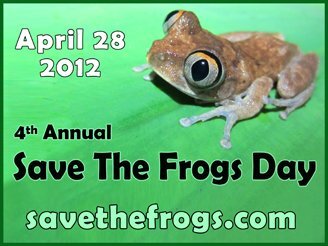 Save The Frogs Day is the brainchild of the Save The Frogs organization, which was founded by Ecologist Dr. Kerry Kriger in May 2008, and is the world’s largest day of amphibian education and conservation. Save The Frogs is the first, and only, public charity dedicated solely to protecting members of amphibian species – caecilians, frogs, newts, salamanders, and toads. The organization includes educators, naturalists, policymakers, and scientists who are all passionate about their dedication to saving the world’s amphibians. Our mission is to protect amphibian populations and to promote a society that respects and appreciates nature and wildlife. Our vision is a world in which not a single amphibian species is threatened with extinction. With your advice, your involvement and your financial support, we are 100% positive we can SAVE THE FROGS! Did you know that nearly one third of the earth’s 6,485 amphibian species are on the brink of extinction? Up to 200 species have disappeared completely since 1980. Even scarier, is that six of the major factors contributing to the issue are due to human activity: climate change, habitat destruction, infectious diseases, invasive species, over-harvesting, and pollution & pesticides. We must all work together to Save The Frogs!! Frogs are an integral part of the world’s food web. Tadpoles feed on algae, helping to keep waterways clean, while adult frogs eat the insects around them, including those that can transmit fatal illnesses to humans (like mosquitoes that spread malaria). Frogs also serve as a food source for larger animals such as birds, fish, monkeys, and snakes. If frogs vanish from the planet the balance of life on earth would be greatly affected. Due to their permeable skin, frogs are incredibly sensitive to disturbances in their environment and can easily absorb toxic chemicals; this trait makes them excellent indicators of environmental stress. The health of the world’s frogs is indicative of the health of the biosphere as a whole. – Frogs do not drink water, they absorb it through their skin. – When a frog hibernates its bones develop a ring, much like trees do. Scientists use these rings to figure out how old a frog is. – Frogs are found in almost every climate and all over the world except for Antartica. – The Goliath Frog is the largest frog in the world, with a body length of one foot and weight of up to 7 pounds. This entry was posted on Saturday, April 28th, 2012 at 3:27 PM	and is filed under Misc.. Both comments and pings are currently closed.